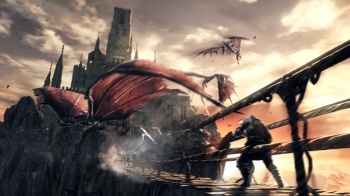 Director Yui Tanimura admits that the last time Dark Souls turned up on PC, it kinda stank. Hot on the heels of a recent promise to keep the difficulty high, comes another vow from Dark Souls 2 director Yui Tanimura. Yes, the last time Dark Souls turned up on PC, it was "sort of half-assed," Tanimura admits, but next time, he says, all the cheeks will be in play. "Last time, we started working on PC after the console version was complete," Tanimura told Shacknews. This led to problems with development and, ultimately, an inferior product. Tanimura is determined that won't happen again. "This time," says Tanimura, "because we are considering the PC from the beginning, you can be sure there will be more care put into PC development." Not only that, but there will be no release delay; the PC edition will launch simultaneously with the other platform launches. Still no word on exactly when that will happen, mind you, but at least PC gamers have some idea of what to expect when it does.